Joe Ide jumped to prominence for the first of his Isiah Quintabe books IQ, back in 2016. That book was shortlisted for a slew of major crime awards for good reason. Ide, a fan of Conan Doyle, took some of the key aspects of Sherlock Holmes and transposed them into a modern, community detective in South Central area of LA. IQ was quickly followed by a sequel, Righteous and now comes Wrecked. Wrecked has a shocking and violent cold open. A group of Iraq vets are torturing a man using all of the soul and body destroying techniques that they learnt in Abu Graib. This turns out to be the middle of a tale which starts with IQ being asked by an artist named Grace to find her missing mother. IQ is already a little obsessed with Sarah and agrees to take one of her paintings as payment for his services. But it turns out that Sarah herself is in danger. Her mother has threatened to release pictures of the Iraq vets and their boss Walczak if he does not pay her one million dollars and they see Grace as a way of getting to her mother. At the same time, IQ’s self appointed partner, Dodson is also being blackmailed, and criminals from both of their pasts are gathering. While there is some element of mystery here, Wrecked plays much more like a standard thriller with the threatening force revealed early and the tension slowly ramping up as the vets get more desperate and more violent. IQ does use some of his deductive talent, but this entry relies much more on his on-the-fly plan making and street smarts. The side subplots are a little distracting but provide some colour and some satisfying resolution. 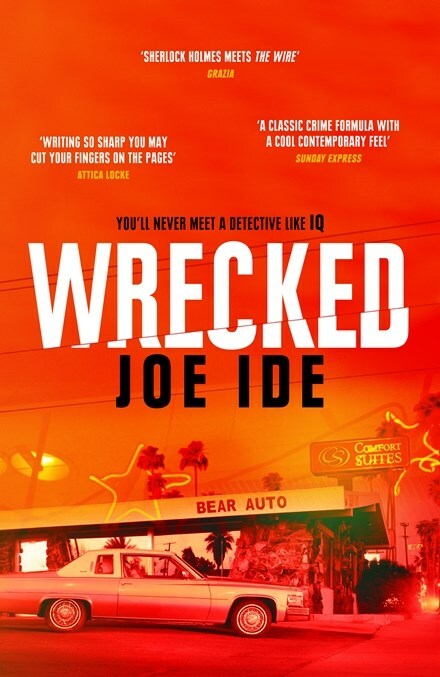 Besides the well handled action, the strength of Wrecked is in the characters, dialogue and setting. Despite their desperation and criminal tendencies, Ide clearly loves these characters and their environment and creates a vivid community. From the local coffee shop to the junk yard and the suburbs, with a side trip to the culmination of the Burning Man festival, Ide gives a vivid picture of modern LA and its inhabitants. Wrecked is another strong entry in a great series. While there are plenty of call backs to action and events in previous books it can be read as a standalone. But as with many series, starting with the award winning debut and moving forward is always best.